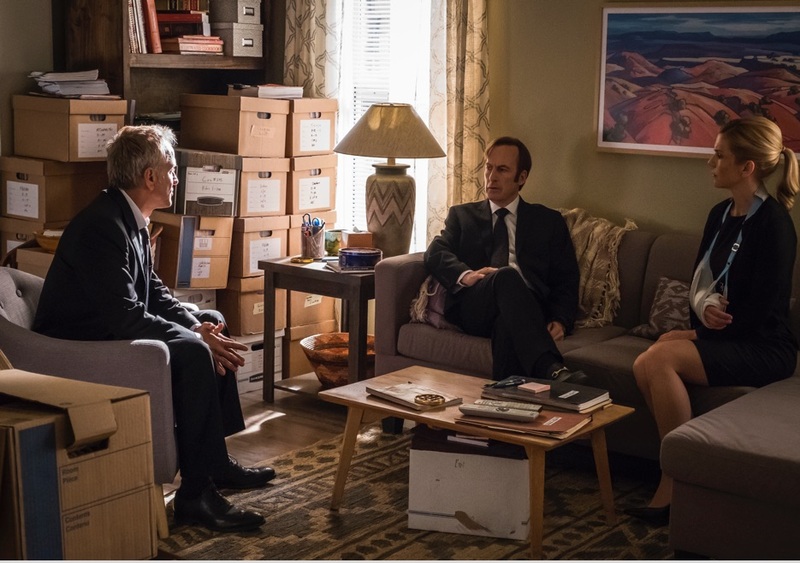 When Season 3 of Better Call Saul ended, we were left with only two small threads keeping Jimmy McGill from fully transforming into Saul Goodman: Kim and his suspension from practicing law. Kim’s significance to Jimmy’s dark journey has been evident from the beginning. But at no time has it shown itself as completely as when Jimmy abandoned a plan that would have provided him with over a million dollars and most of his elderly client contacts intact. Kim’s accident caused an about face that brought Jimmy back from the twisted place he lived in the 2nd half of season 3. But the final moments of “Lantern” (the season 3 finale) threw a new wrench into Jimmy’s (and everyone else’s) journey with the death of Chuck. Well, at least that is what we thought it would do. At the end of “Smoke,” the season premiere of Better Call Saul’s fourth season, it appears all Chuck’s death really did for Jimmy was show just how cold he’s become. For most of last night’s episode, Jimmy appeared genuinely conflicted about his brother’s death. Did he feel responsible for killing his brother? Was he ready to pounce on someone the moment he found out who was the most responsible for Chuck’s sudden fall? But the moment Howard revealed his actions (at least that is how Howard felt) were what lead Chuck to fall back off the electricity bandwagon, Jimmy seemed relieved instantly. Or was that not relief at all on Jimmy’s face? Was that satisfaction knowing that his insurance slip was the push that moved Chuck towards his ultimate end? Now, that second mindset paints a real twisted picture of where Jimmy is now. 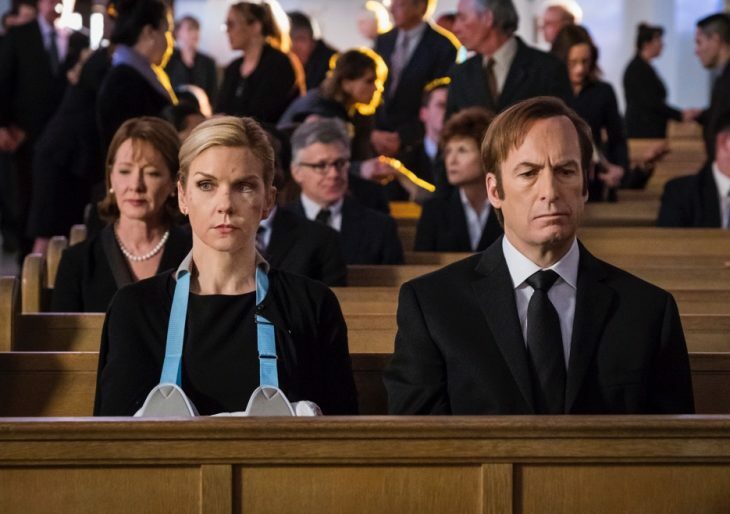 But just the sudden relieve Jimmy experienced knowing Howard’s actions pushed Chuck over the edge is enough for us to know that as of the start of season 4, we are following a character who is far more Saul Goodman than he is Jimmy McGill. Monday’s premiere also previewed the fall-out of Hector’s death. We also see Mike in a story line not worthy of his considerable abilities. But let’s start this week’s recap with a visit from our pal Gene and the first signs that his previous life as Saul Goodman might be catching up to him. 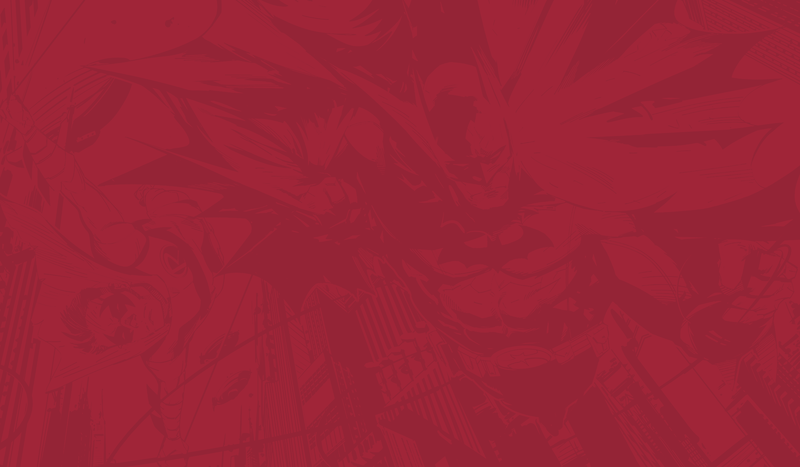 BCS continued its tradition of starting the season with a clip of Gene, the secret identity of Saul Goodman, as he hides from authorities in Omaha, Nebraska. Things pick up right where we last left Gene after he fainted on the floor of the Cinnabon he manages. Gene is taken to the hospital where everything checks out OK. But visiting a hospital means someone diving deep into your records. And Gene wants to get out of there as soon as he can. Unfortunately for Gene, the nurse can’t get his information to show up through his driver’s license, so she asks for a social security number. That fake number also appears to be turning up lame. A nervous Gene visibly shakes as he waits for the nurse, who finally realizes she entered in an O instead of a 0 (do you see the difference?). Gene trying to leave the hospital while the nurse at the desk looks up his information. But that would not be Gene’s biggest scare of the night. The Taxi he called has an Albuquerque themed air freshener on the rear view mirror. And the driver takes a real creepy look at Gene before Gene decides he wants to get out and walk the rest of the way. After Gene steps out of the cab, it stays parked until Gene turns the corner. Gene is breathing nervously when we go to the opening credits. So was it all a coincidence that cab driver had an Albuquerque air freshener in his cab? Or is someone from Gene’s previous life now tracking him in Omaha? Let’s hope this is not the last we see of Gene in season 4. Now, I know we are going to get more of Mike and his creative adventures in season 4. But what a lame beginning to the season for one of the series’s best characters. 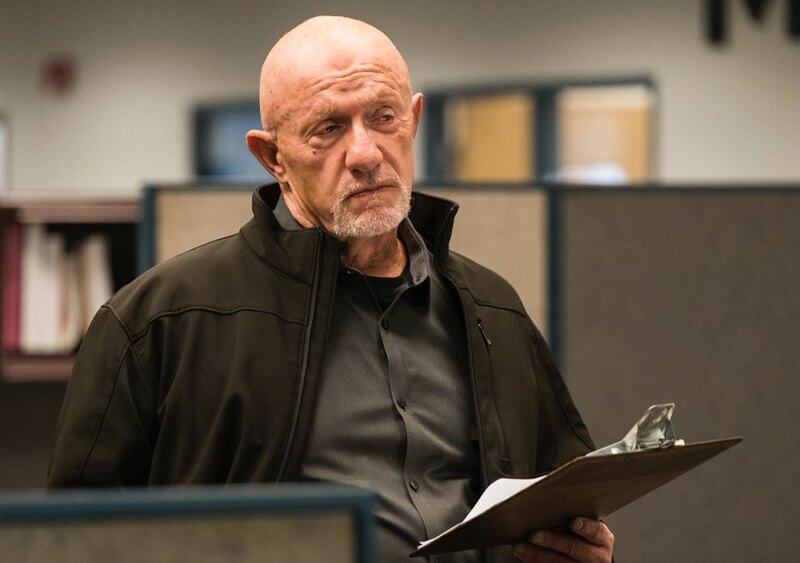 In the season premiere, we basically get Mike calling Madrigal’s payroll department. Then, he does a “security check” of the company’s operation. And sure, it was still cool to see how Mike can make something as simple as a routine security check seem interesting. He gets into the company by taking the ID of a guy named Barry. The ID was enough for Mike to coast into the company, no questions asked. Mike also inspected the Warehouse, noted where security cameras were located, and returned the stolen ID to Barry, who was able to get in with a temporary guest pass. Mike later rips the manager of the office for lax security procedures. Now, was Mike doing this just to cover himself for what his actual job with Gus is? Or does Mike have genuine concerns about the security of the company now responsible for putting a legitimate front on his illegitimately gained money? Either way, lets hope Mike gets back to doing cooler things than this sooner rather than later. Mike working as a “Security Consultant” for Madrigal. With Hector out of the picture, Don Bolsa wants to meet with Nacho and Arturo. He wants the two men to continue running the Salamanca territory despite there being no Salamanca’s to run it. Gus smells trouble, and tells Don Bolsa as much. He fears, with Hector out of commission, that someone will come for the Salamanca territory. And that war will draw unwanted attention from the DEA. If you recall from last season, the Salamanca supply is being delivered with Gus’s through the Los Pollos Hermanos trucks. So any threat to the Salamanca’s is also a threat to Gus. And Gus also seems to know the role Nacho played in Hector’s stroke. He has Viktor follow and track Nacho while Nacho is throwing the fake pills used in Hector’s stroke off the side of a bridge. Nacho dispersing the fake pills unaware he’s being followed. Jimmy is up early one morning looking for jobs when he gets the call from Howard that Chuck is dead. And Jimmy knows instantly something happened that caused Chuck to relapse. Those thoughts stay with Jimmy the rest of the night and into the next morning. He remembered the last time he saw Chuck. Chuck was back to normal, but Jimmy noticed all of Chuck’s appliances were thrown in the backyard. Jimmy kept the same face throughout the rest of the episode as he tries to come to grips with what happened to Chuck. He keeps the same stoic, unreadable expression until Howard has something to confess to Jimmy and Kim. While the official report from the fire marshall framed Chuck’s death as an accident, Howard knows better. He thinks Chuck killed himself, and Howard blames himself for it. Here, we have the three principal actors outside of Chuck who could all blame themselves for what happened to Jimmy’s brother. Kim could blame herself because of her role at Chuck’s trial. But Howard dismisses that quickly, noting how much Chuck improved after the trial. He then brings up the “insurance thing,” which gets Jimmy’s attention right away. Now, Howard doesn’t know Jimmy was the one who let that cat out of the bag. And Jimmy does not divulge that information here. So Howard moves onto how he pushed Chuck out of the firm. Howard blames himself. And Jimmy does nothing to reassure him it wasn’t. In fact, either the revelation that Howard feels responsible or the role the “insurance thing” played in Chuck’s passing (the scene doesn’t make clear which one) brings a sadistic smile (for the circumstances) to the face of Jimmy. He gets up, feeds his fish, and offers to make anyone a cup off coffee, ready very quickly to return back to normal. -Chuck’s obituary was entirely career achievements with a little nod to his volunteer work. That’s a sad commentary on his inability to develop and maintain strong relationships with others. -It was good to see Cliff Mane, Rick Schweikart, and Rebecca (Chuck’s ex-wife) at the funeral. -Also, a very nice touch putting Rebecca’s song, the one Chuck played on his piano to remember Rebecca back in season 2, in the background at his funeral. -It’s also good to see Mike making use of the water hose he cut holes in to stop Salamanca trucks at the border. -The Driver’s License Gene presents to the nurse is the one Saul had made for him in the next to last episode of the series. -Viktor with a K (the man Gus would brutally murder at the start of season 4) makes another appearance tonight tracking Nacho for Gus. Season 4 is underway, and I think it’s safe to say it will likely be the most twisted of any season so far. See you next week.